To figure your pond liner size: Take your measurements: Maximum width, Maximum length and Maximum depth. Now take your maximum depth and multiply this number by 2. Take this figure and add 2 for your overhang (This is counted as 1' for each side multiplied by 2). Now take your total and add to your maximum width and add the same number to your maximum length. You will most likely need to round up to match one on the pre-cut liner sizes. Here is an example: Maximum width = 5' Maximum length = 10' Maximum depth = 2.5' (2 x 2.5' = 5' + 2 = 7) (7 + 5 = 12' width) (7 + 10 = 17' length) So you would need a liner close to 12' x 17' and the closest would be 15' x 20'. You could also back fill, re-measure and see if you can get your measurements to 10' x 15'. Liner Rolls for contractors and dealers at a lower price. Please Email Us for more information. Free Ground Shipping to the Continental USA only. Pond Liner only ships ground. Please select your Pond Liner Size from the drop down box then click Go to see more information about the size selected. Sizes in red ship by motor freight. Fish friendly - PondGard pond liner is based on EPDM synthetic rubber, a highly flexible stable material that's not only long lasting and easy to work with, but safe for fish and plant life. Highly flexible - stays flexible in a variety of temperatures- from -40 degrees F to 175 degrees F- enabling it to be installed year round. And unlike some other liner materials, PondGard contains no plasticizers which can embrittle with age and cause cracks or splits in the material threatening fish and animal life. Design versatility - can easily be shaped to fit the unique contours of your pond giving you much more design creativity. Multiple membrane panels can be quickly and securely seamed to accommodate larger pond lining applications and unique design elements such as waterfalls. Weather resistant - shows outstanding resistance to the harmful effects of ultraviolet radiation (UV), ozone, and other environmental conditions- important characteristics especially along the water line of the pond where the liner can be exposed. Extreme durability and high elongation - PondGard EPDM has a characteristic that enables it to conform to objects in the subgrade. PondGard will stretch over exposed rocks and tree roots. 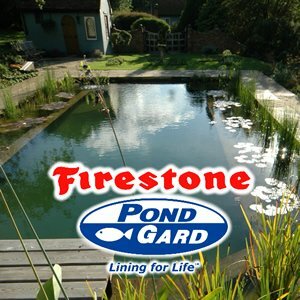 Look for the Firestone PondGard name, it is a mark of quality and confidence for a durable, beautiful, fish-friendly pond. View FIRESTONE PONDGARD INSTALLATION VIDEOS to see 22 different Videos of Firestone PondGard liner installation and techniques. 1. What does EPDM mean and why should I care? EPDM is an abbreviation for Ethylene Propylene Diene Monomer. If you are a chemist you are probably thinking “WOW! I wish I would have thought of that”. For the rest of us it simply means this is some really high quality liner that is meant to last for years. In fact, testing by Firestone has shown this liner to degrade only ½ mil per year when exposed to direct sunlight. This means that on average a 45 mil liner will still be around nearly 90 years from now! Of course the warranty is for 20 years but with proper care many customers exceed that amount by years. 2. What is 45 mil liner? 45 mil stands for the thickness of the liner material. It is 45/1000 of an inch thick. That may not sound like a lot but this super sturdy liner is the choice of professional pond installers and consumers all over the world. To give you an idea of the outstanding strength of this liner consider that 3.2 square foot of 45 mil liner will weigh 1 full pound. 3. Why is FIRESTONE PondGard EPDM liner better than a cheap PVC liner? Excellent question and one that is not asked enough! Lets talk about PVC liner first. PVC liner is super cheap and really easy to work with since it is so thin. PVC liner is lightweight compared to heavy duty Firestone EPDM and often costs much less to ship. Sounds good right? Now the downside. Liners containing PVC are made with plasticizers to keep them flexible. Over time, or when exposed to the sun these plasticizers leach out of the liner leaving it brittle. In as little as one year a pvc liner can be brittle enough to split open under the weight of your pond water and one day you look out to find an empty pond. It is possible to cover the PVC liner with enough rocks and dirt to prevent the sun from reaching it and this will give you a few more years of use. The question you should be asking yourself is whether you wish to make the cheapest pond possible or whether you wish to build a pond that will last and be enjoyed for years to come. Building your pond with the cheapest liner possible is like building a house with foundations made of sand. It may look nice for a while but in the end you will come to deeply regret spending the few extra dollars to do the job right. 4. What does “FISH SAFE LINER” mean? Firestone PondGard 45 mil EPDM liner is manufactured to be fish safe. That means that the ingredients used in making the liner are perfectly safe for your fish. The same ingredients are used with EACH AND EVERY batch of Firestone liner produced. In the history of Firestone brand pond liner no fish has EVER been determined to have died from exposure to PondGard liner. Imported liners SOMETIMES use ingredients that are fish safe, and SOMETIMES they do not. Apparently the market price of these ingredients changes quite a bit. Firestone simply commits to using the safest ingredients for making its PondGard liner while many imported pond liner manufacturers will use the least expensive ingredients available at the time of the production run. Sometimes you get the good stuff, sometimes you don’t. It is your choice which pond liner you choose but if you stock your pond with a few hundred dollars worth of fancy goldfish or a few thousand dollars of imported Koi I think you will agree bargain imported pond liner may not be such a bargain after all. 5. CAN I USE ROOFING Liner for my pond? / What is a toxic pond of death? Sure you can……as long as you don’t mind dead fish! Roofing liner is very similar to PondGard pond liner. Unfortunately, just like some imported pond liners roofing material is made of ingredients based upon current market prices. Sometimes it is made with ingredients the same as “fish safe liner” sometimes it is not. If you get a batch of material that is not made with “fish safe ingredients” you could end up with a toxic pond of death. Roofing material is often made with harsh ingredients such as arsenic that can sicken or kill your fish. If you install unsafe liner material in your pond you will soon see the fish moving around very lethargic and they will have a loss of apatite. At that point your fish will die and there is nothing that can be done about it. But wait a minute, you may have tested water running off your roof and have found it to be chemical free. Does that mean the material is safe for your pond? Not at all. When testing roof runoff you are testing water that has quickly passed over the roofing material and not had a very long contact time. Water in a pond is in constant contact with the lining material and this constant contact will show a much higher concentration of hazardous chemicals. Avoid the chance of turning your backyard oasis into a “TOXIC POND OF DEATH” and use Firestone certified fish safe 45 mil EPDM liner. 6. WHY DO I NEED UNDERLAYMENT? / Can I use newspaper or old carpet instead? To answer those questions we need to know what exactly underlayment is and what it does. A proper underlayment is considered a “non woven Geotextile” That is a fancy term for saying it is a really tough material that is lightweight and easy to work with. Underlayment has only one job and that is to protect your pond liner. 45 mil Pond liner is very strong and puncture resistant but it does have its limits. Using a 7oz thickness of underlayment can improve the PUNTURE RESISTANCE of your pond liner by 400%. Strangely, using a thicker underlayment will not significantly increase the protection to the liner but using a thinner one will greatly reduce your protection. “I want to use newspapers for an underlayment.” Great, go right ahead. Just make sure you test the thickness that you need by stacking enough WET newspapers over a sharp rock that it does not poke thru when you put 20,000 lbs on top of it! The average 2 foot deep pond that is 11x16 foot will have enough water in it to exceed 10 TONS. That’s over 20,000 pounds of water in your pond. If you use newspapers as your underlayment you better stack them about 1 foot thick. That’s a lot of Sunday papers folks! “I want to use sand for an underlayment” SEE ABOVE. Unless you OWN the beach you are getting the sand from it is a BAD and expensive idea to try and put enough sand down to protect your pond liner from rocks hidden under the surface. These rocks will emerge over time as the HUGE weight of your pond presses down on it. “I want to use old carpet for an underlayment” Got allergies? No, well you soon will have. Yes, then stay away from your pond all together as it will soon make you sick. Look folks, saving money is my favorite past time but doing so at the risk of my health has never been high on my list. Carpets are NASTY , DIRTY, BACTERIA FILLED MOLD ATTRACTORS! And that’s when they are dry in your home. Now take this same filthy used rag and put it under your pond liner where it will sit wet and moldy for the next 10-20 years. In this case your fish will be fine but as far as the people around the pond, their health is in your hands. Save money when it makes sense and spend money to ensure your family and friends enjoy your new pond without the need for allergy shots! 7. How much liner do I need? 2. Take the max depth (not the average depth) and double that. “2 foot deep would be 4 foot” If the liner goes down into the pond it must come back up! That is why you double the depth. Special Liner sizing Notes: 1. When attaching a waterfall filter that will be elevated above the pond, you will need additional liner. If you have a 4 foot tall waterfall then you will need an additional 4 foot of liner on that side. 2. When constructing a larger pond, you may need to use additional liner on each side to anchor the pond. For large ponds consider using 2 foot of liner on each side and for extremely large pond you should call for assistance. 8. 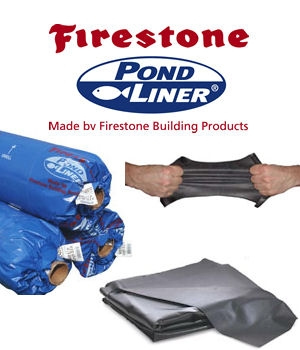 What sizes does Firestone PondGard liner come in? Great question! Firestone Pond liner comes in lengths up to 200 foot in the following widths: 5, 10, 15, 20, 25, 30, 35, 40, and 50 foot. This means the smallest size you could buy is a 5x5 and the largest size available is a 50x200. The 5 foot liner is only available in up to 100 foot rolls. 9. Do you have other Firestone Accessories for sale? Yes we do. 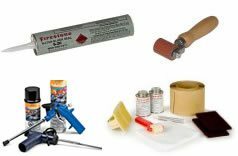 From seaming tape, to pipe boots, repair kits and primer, Graystone Creations has a full line of the products you need to install and maintain your pond liner. 10. Is there a warranty on Firestone PondGard liner? Yes there is. Firestone stands behind their product for 20 years. To obtain the 20 year warranty the liner must be installed to Firestone specifications which include the use of a protective Geotextile underlayment. At Graystone Creations we have learned a great deal about Firestone quality control in pond liner production. Each roll of liner is run through a laser that measures irregularities in material and seaming. Nothing gets out of the factory in less than premium condition. While obtaining certification to install Firestone brand Pond liner Graystone Creations has had the opportunity to learn about Firestone warranties and procedures. It was brought to our attention that only one section of Firestone liner has ever proven to be defective and that was on a seam where two rolls joined. If you feel at any time your properly installed Firestone PondGard liner is defective Firestone will ask you to immediately send the questionable section to them. They will fully inspect the material right down to the microscopic level. They will work with you to determine how the liner was installed, if underlayment was used, if roots pushed through into the pond or if the liner was cut or punctured by any foreign object and much more. It is Firestones greatest pride to manufacturer a superior pond liner and every effort will be taken by teams of scientists to determine what caused the failure and how to prevent similar failures by proper installation. 11. How can I tell I am really getting Firestone PondGard liner? Great question. Most rolls of Firestone liner leave the factory with periodic Firestone PondGard fish logos on them. It is possible to receive a small enough section of liner that you may miss one of the marks but if you ever have any doubt just ask. NOTE: Over the last couple years I have occasionally seen rolls arrive from the factory without the Firestone logo on them but that is pretty uncommon. 12. My liner has footprints on it. What happened? We walked on it! The size of the liner ordered will depend upon which roll we cut your order from. Very large liner sizes require both unrolling of the liner in our warehouse and the cutting and refolding of the liner so we can ship it. Sometimes it takes several workers to fold and roll large sections of this very heavy liner and it gets stepped on. Yes the size 13 print is my own! 13. There are some dried silver looking specs on part of my liner. Is that paint? Nope! Occasionally the curing / drying process will leave some silver colored spots on the liner. This discoloration is minor and in no way effects the use or quality of the Firestone liner. 14. Why is Firestone Pond liner so expensive to ship? Firestone 45 mil EPDM PondGard Pond liner weighs about .30 pounds per square foot. This means a 20x25 foot (500 square foot) liner will weigh 150 lbs. There is no cheap way to ship this liner. Liners over 150 lbs ship by freight and require a signature upon delivery. Freight orders will require 2 or more people to unload and transport the liner to its location. VERY large liners may require as many as 8-10 people to move into position in your pond. Graystone Industries ships most pond liner from a warehouse in Franklin NC. Walk in customers are welcome Tuesday thru Friday. Pond liner orders to the west coast generally take 5-6 business days to arrive. 15. This liner is so expensive, why? You have got to be joking! I don’t know of a single other product in the USA that has fallen so much in price while costs have soared so much. 16 years ago it was typical for pond liner to be sold in retail stores for $1.25 to $2.00 a square foot. Back then a pond liner distributor could obtain pond liner for about 25 cents a square foot. FLASH FORWARD TO 2014: Prices of oil and transportation have soared making even the largest liner distributors paying about 50-55 cents a square foot. With shipping costs that often exceed 20 cents a square foot depending upon distance and location there is very little money to be made selling pond liner at any price yet thanks to fierce competition online prices are below $1.00 per square foot with shipping included. Pond liner is heavy, difficult to cut and package, and very expensive to ship. Companies offer pond liner to customers at very close to their costs in hopes they will consider the purchase of the other needed pond supplies. No one makes money just selling pond liner. Please consider Graystone for your other supplies and allow us to create a complete pond package with components that work well together and is crafted for your specific pond needs. There are few things in pond keeping that are as frustrating as dealing with a leaking pond liner. Days of hard work during installation are frustrated by a pond that loses water in spite of your best efforts. Fortunately, there are a few easy things to check that should narrow down exactly what is happening in your pond and get you back to enjoying your pond. 16. Why should we purchase liner or other pond items from Graystone Creations? My name is John Olson and I am the CEO of Graystone Industries. I have devoted myself to assisting consumers in the Garden and Pond Industry. To keep on top of trends and breakthroughs in the pond world I travel the country studying and teaching at industry events. In the last 18 months I have traveled to FIRESTONE CERTIFCATION CLASSES in Redlands CA, Tulsa OK, Oklahoma City OK and Savannah GA. I am a certified installer of both residential and commercial Firestone liner projects. 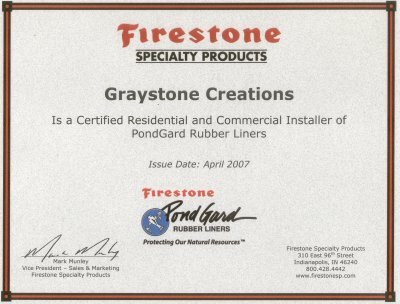 Additionally, 6 other members of the Graystone Industries organization have completed courses and obtained their own Firestone Certification. I honestly believe that no other on line vendor in the United States has had more hours of training and certification than the members of Graystone Industries. What that means for you, the consumer, is that you will receive the very best service, accurate quotes, intelligent answers to questions, and guidance towards the purchase of products that will best meet your needs. At Graystone Creations we believe a well informed customer is not a threat to a successful business but its very foundation.